Advanced ballet are vocational levels. 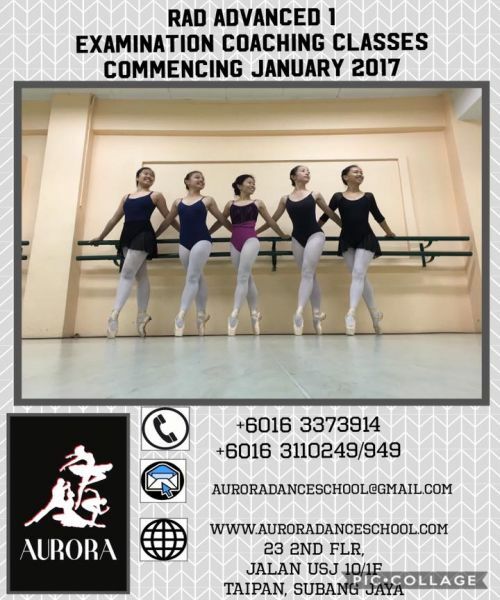 At Aurora School of Dance, we adhere to the curricula from the Imperial Society of Teachers of Dancing UK (ISTD-UK) and the Royal Academy of Dance UK (RAD-UK). We have graduated hundreds of advance student with distinction since the late 1980s. Many are now dance professionals in Malaysia. By the time the students attains these levels, they are proficient to consider a professional career in dance. The majority will compete in ballet and modern dance competitions regionally and around the globe. We have represented Malaysia in competitions and exhibitions in the USA, UK, South Africa, Russia, Australia, Hong Kong, Japan and Singapore. They frequently appear and perform at local television shows, public and corporate events. The preparation is a journey of success in itself and creates opportunities for these advanced students to work with world renowned choreographers in productions and workshops. All advanced students assists in classes. In helping with corrections and choreography they understand their own dance better. 4 – 5 times weekly including pointe and virtuoso classes.